Retreat this Fall! • Run Hard. Rest Well. King David was a man of retreat! Psalm 142 was a prayer written by David while retreating in a cave. When was the last time you went on a retreat? Retreats are good for the soul. Retreat, large group or personal, allows us to move away from the frazzling demands of every day life. 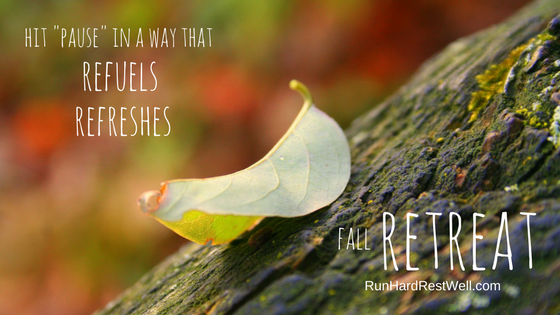 It’s a chance to hit “pause” in a way that refuels and refreshes. Retreat is an outward journey that uniquely and powerfully nurtures our soul’s inward journey with God. Fall is a fabulous time for retreat . . . group or personal, schedule one this week! If you live within a few hours of Fort Wayne, consider one of our five fall retreats this year. October is beautiful time to slip away and enjoy a “day away,” or an overnight getaway with your spouse. Come explore the topic, “Run Hard. Rest Well. — Together!” This refreshing retreat is not a “heavy duty” marriage experience, but a refreshing time off the beaten path — together. Explore biblical insights, small group discussions, and an afternoon free to hike, kayak, read, rest, and laugh. Campfire s’mores will close our time on Saturday evening. Your retreat experience can be one-day or two. You choose! Sunday will include worship and the chance to pick from one of two workshops before lunch. The afternoon is yours to enjoy . . .
Run Hard. Rest Well. empowers people to rewrite their personal, professional, and family-life stories of overload. God’s design for work, rest, and rhythm is counter-cultural, revolutionary, and the remedy for much of what ails us today. With a singular passion for vibrancy and Kingdom Work, Run Hard. Rest Well. arms people with low-cost, high-yield strategies that create New Life and renewed passion for the people of God. Click here for additional information and registration.